Washington, we have a problem. After an eight day All Star game break, the team forgot that they had a game against the Cavaliers who only trailed them by one game in the standings at the time. 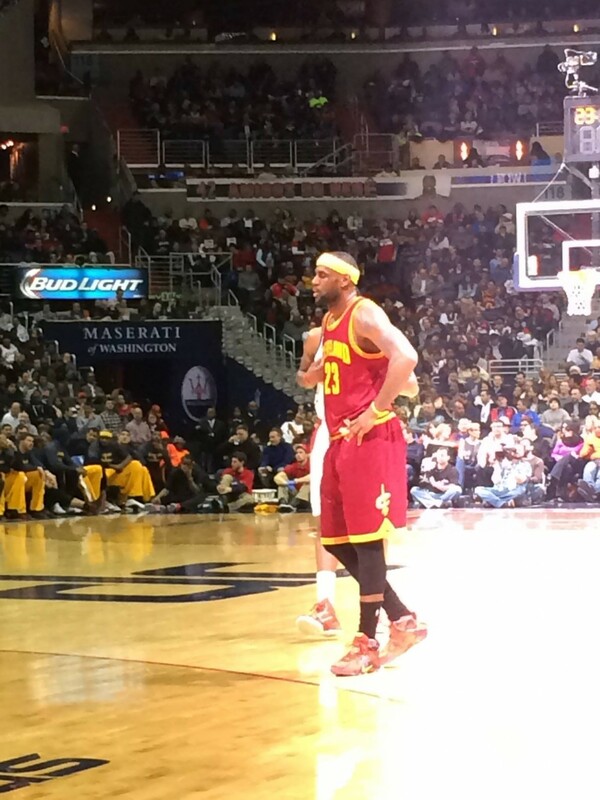 Lack of heart, terrible defense, turnovers; it was all on display tonight as the Cavs crush the Wizards 127-89. The Cavs missed their first two shots and John Wall scored the teams first bucket to take a 2-0 lead for the Wizards early; that was about all that went right for this team. The Wizards gave up a season high 35 points in the first quarter to the Cavs. The Cavs had 50 points in the paint and scored 18 points in transition, many were easy leak out layups or dunks. Lebron gave the Cleveland “fans” something to cheer about early with a thunderous alley-oop from Kyrie Irving in transition. The Cavs were hot from 3 connecting on 14-33 overall. LeBron James, Imam Shumpert, J.R. Smith, and James Jones all had three made three pointers in the game. The Wizards on the other hand went 1-16 from three point land with their one three coming in garbage time from Otto Porter. The second quarter was more of the same. The Wizards turned the ball over which led to an easy breakaway dunk from LeBron James which got the crowd off their feet. Nene played well in the first half going 8-10 from the field with most of his shots around the rim. His aggressiveness has been nice to see and he’s no longer settling for jumpers. The Cavs continued the quarter hot connecting on 10-13 field goals to start the quarter and were able to stretch the lead to 22. The Wizards went on a mini 6-0 run to end the quarter including a heads up diving on the floor hustle play from John Wall to steal the ball from Kyrie who was trying to be a little too cute with it. The Wizards trailed 65-51 at half. 65 points was the most they’ve given up in a first half this season. The Wizards started the third quarter on a little run and were able to cut the lead to 11 early. That changed very quickly as LeBron hit threes on back-to-back possessions. J.R. Smith got in on the three party knocking one in which stretched the lead to 21. Nene went up for a put back and came up hobbling. He was later diagnosed with cramps. The Wizards never got back under 20 the rest of the way. Final score was 127-89. The Wizards need to improve and do so quickly as the Bucks are only 1.5 games behind them now. This game was an utter disappointment for a team coming off the All Star break looking to make a strong finish into the playoffs. Previous postStock Watch: Whose is rising, whose is falling?